Gotta get up to get down, Johnny. 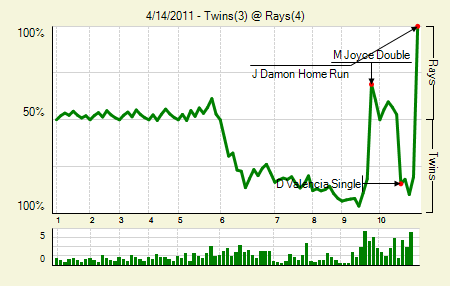 Matt Joyce: 3 for 4, 1 2B. That double tied the game in the ninth. That’s a nice beginning to his recovery from a 4 for 29 start. Carl Pavano: 8 IP, 4 H, 0 R, 2 BB, 7 K. That’s 9 ground balls and 7 strikeouts to the 29 batters Pavano faced. After a rough first start he’s bounced right back. Moving the Needle: Jose Morales doubles home the go-ahead runs, +.344 WPA. 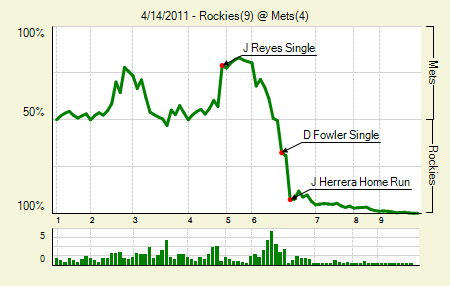 The Mets jumped out to a lead in the early game, but the Rockies turned things around in the sixth. Troy Tulowitzki, instigator that he is, opened the inning with an innocent single. 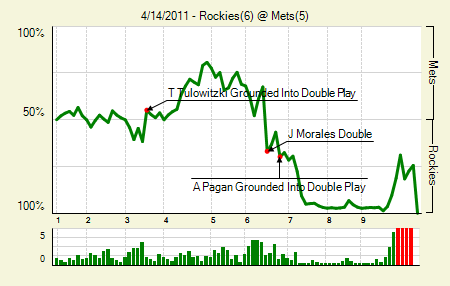 The Rockies kept thing moving, despite Tulowitzki eventually getting thrown out heading for third. With runners on first and third with two outs, Morales skied one to right. Scott Hairston either didn’t get a read on it, or didn’t know how to play it, and he ended up shuffling his feet as the ball landed beyond him. Both runners scored, putting the Rockies up. Two homers in the next frame gave them a 6-2 lead, one that they nearly blew in the ninth. David Wright: 1 for 5, 1 2B. Notable, because he came to the plate with the bases loaded and two outs in the ninth, with the Mets down just a run. On the 3-2 pitch he drove one to right, and if they’d been in the ballpark in the other borough it would have been a walk-off grand slam. Hell, in most of the 29 other parks it would have given the Mets the game. But not at Citi. It will go down as Wright failing in the clutch, but he really did all he could to win that game for his team. Troy Tulowitzki: 3 for 4, 1 HR, 1 BB. It’s a shame his homer came when the Rockies had a lead, rather than when it would have made a bigger WPA difference. I was kinda getting used to writing “Troy Tulowitzki homers” in the Moving the Needle section. Moving the Needle: Jonathan Herrera drives in three with a homer to right, +.235 WPA. After dropping the first half of the twin billing, the Mets got out to a 4-2 lead in the evening game. But in the sixth, starter Chris Capuano fell apart, surrendering three runs and leaving two on with two outs. Taylor Buchholz came on to face the lefties Herrera and Carlos Gonzales, but didn’t get the job done. Herrera got out in front of one and hit a bullet over the right field fence, giving the Rockies an 8-4 lead and essentially clinching the series sweep. Troy Tulowitzki: 2 for 4, 1 HR, 1 BB. Jeff Francoeur called Citi Field a joke. Does this mean Tulowitzki thinks Francoeur is a joke? Moving the Needle: Prince Fielder get the Brewers on the board in the first, +.117 WPA. After some early displays of offense, the Pirates have had trouble scoring runs lately. 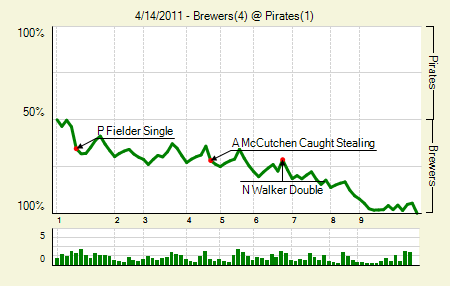 So when the Brewers jumped out to a first-inning lead things didn’t look bright. They followed up Fielder’s RBI single with another run in the first and held that lead all the way to the ninth, when they tacked on a pair. Fielder has just two hits in the past two days, but both were the high-WPA hits. Randy Wolf: 6.2 IP, 3 H, 0 R, 2 BB, 10 K. Last time he struck out 10 in a game was August 16, 2009. That doesn’t feel like so long ago, I suppose. Moving the Needle: Carlos Ruiz breaks the scoreless tie in the sixth with a line drive homer, +.169 WPA. Pitching ruled this game — at least through five. Jordan Zimmerman had sat down 15 Phillies in a row, but he lost the perfect game and the shutout on the first pitch of the sixth. 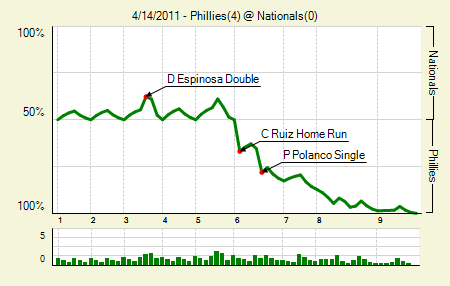 The Phillies tacked on one more that inning, and then tagged Zimmerman and Drew Storen for another pair in the eighth. As it turns out, the Phillies starter was just a bit better. Cliff Lee: 9 IP, 3 H, 0 R, 1 BB, 12 K. Something tells me this will not be the last time that Halladay and Lee pitch back-to-back complete games this season. If you have a couple of minutes, I suggest watching his highlight reel.Lots of Ks looking. Moving the Needle: Brett Wallace guns down Eric Patterson at the plate, -.181 WPA. Well, it was positive for Wallace and the Astros, but negative on the WPA scoreboard. 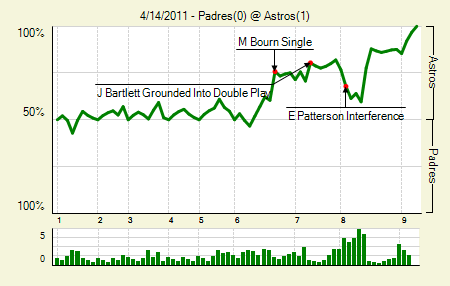 The Padres had runners at the corners with one out in the eighth, down one. They were 0 for 6 with runners in scoring position before Hudson came to the plate, and they’d soon be 0 for 8. Hudson’s hurt the most, though. It was a sharp bouncer to first, and Wallace alertly fired home to cut off the dashing Patterson. The Padres went down in order from there. Bud Norris: 6 IP, 2 H, 0 R, 3 BB, 7 K. It took him 116 pitches to record those 18 outs. It makes for a good, but not great, performance. Still, hats off for the 7 Ks and 7 ground balls. Dustin Moseley: 6.2 IP, 7 H, 1 R, 1 ER, 2 BB, 1 K, 0 HR. He allowed 18 balls in play and sixteen of them were on the ground. Moving the Needle: Base hits? Jorge Posada knows no other way to hit, +.424 WPA. On the season, his first as the full-time DH, Posada has 7 hits. Five of them are home runs. His latest came in the bottom of the ninth with his team trailing by one. They were down early, but chipped away little by little starting in the fifth. 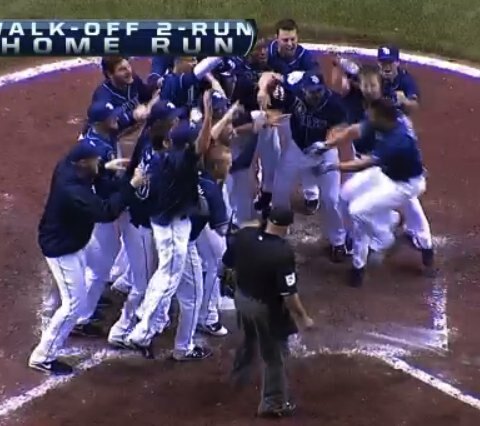 I’m also now convinced that a walk-off sac fly will never be the top WPA play of any game. With a runner on third and less than two outs in a tie game, the home team is already pretty close to 100%. Alex Rodriguez: 3 for 3, 2 2B, 1 BB. He is now 14 for 34 on the season with 4 doubles and 4 homers. Nick Markakis: 3 for 5, 1 2B, 1 HR. Absolutely crushed a flat cutter from Phil Hughes into the right field seats, which was a bad omen of things to come for the Yanks. Moving the Needle: Alex Gordon brings around a pair with a double, +.148 WPA. The Mariners threatened with runners on first and third with two outs in the top of the third, but didn’t score. 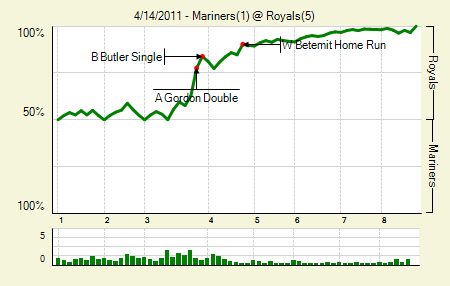 In the bottom half the Royals found themselves with runners on the corners, and only one out. That was the difference, I guess. Gordon grounded one down the first base line, past Justin Smoak and into — not quite the right field corner, since it didn’t quite make it there. But Ichiro had to chase it down, and that allowed both runners to score. Billy Butler followed with a single to bring home Gordon, and the Royals cruised the rest of the way, into the rain that finally ended this one after seven and a half. Melky Cabrera: 2 for 4. He and Ichiro were the only players with multi-hit games. Melky gets props for scoring from first on Gordon’s double. He’s shown some hustle early in the season for Kansas City. Bruce Chen: 8 IP, 6 H, 1 R, 0 ER, 1 BB, 1 K, 0 HR. As some of my friends would say, he is the premier leftballer of our time. Moving the Needle: John Buck singles up the middle and breaks the tie, +.214 WPA. 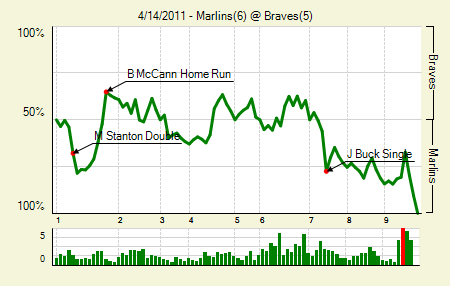 The Marlins and the Braves butted heads in the first, combining for seven runs. The Marlins came back with one each in the second and the third, and the Braves answered in the fourth to tie it. That lasted until the seventh, when the Marlins strung together three singles. 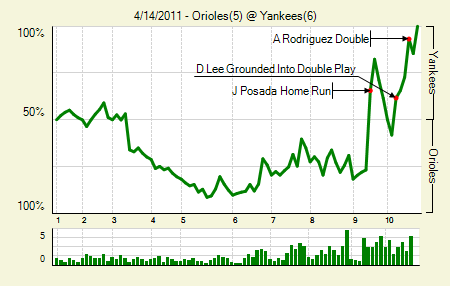 Buck’s hit, the last in the sequence, brought around Gaby Sanchez with the eventual winning run. Brian McCann: 2 for 4, 1 HR. He’s starting to break out of that early season power slump. His three run shot helped answer the Marlins’ strong first inning. Hanley Ramirez: 3 for 3, 2 BB. Hanley, too, has gotten off to a slow start, but the walks have kept coming. That’ll tide him over until he starts mashing taters. Moving the Needle: Ryan Raburn doubles into the gap to break a scoreless tie, +.220 WPA. The good old fashioned pitchers’ duel ended once the starters exited. Or, that is, the A’s starter. Tyson Ross came out for the seventh, in relief of Gio Gonzalez, who had walked six to go with his six strikeouts in six innings. The walks will certainly run up the pitch count. 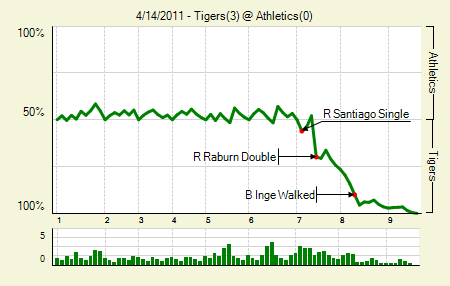 Ross allowed a leadoff single, but caught a break when the Tigers gave away one of their nine remaining outs. Unfortunately, Ross left one out over the plate for Raburn, who absolutely demolished one into the gap and off the wall to score the run. Raburn currently has more doubles, 5, than singles, 4. Phil Coke: 7 IP, 3 H, 0 R, 2 BB, 2 K. It wasn’t the prettiest way to get it done, but he did. The Tigers’ faith in him as a starter has paid off to this point, even though I remain a skeptic. Also, now that he’s a starter it’s virtually guaranteed that Coke leads the league in times pointed to the sky after a ball hit in the air. 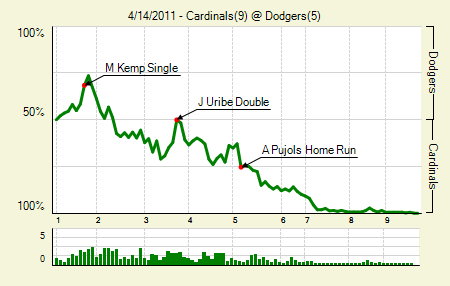 Moving the Needle: Albert Pujols turns on one and puts a run on the board, +.125 WPA. It’s still baffling at this point how slow Pujols has started the season. Entering last night’s game, for instance, he had more than three time as many GIDP as extra base hits. He reduced that ratio last night in the fifth, when he hit a screaming liner off Hiroki Kuroda, clearing the fence in left and giving the Cardinals a 5-3 lead. One day soon Pujols is going to break out of this, and it might be the most entertaining portion of the season. Matt Kemp: 2 for 5, 1 HR. The hot start continues. He was the league leader in WAR heading into the day, but Tulowitzki’s two-homer day helped him catch up. They, along with A-Rod and Joey Votto are the only 1+ WAR hitters right now. Matt Holliday: 3 for 5, 2 2B. He and Lance Berkman have been doing some heavy lifting while Pujols slumps. We hoped you liked reading The Morning After: Game Recaps for April 14th by Joe Pawlikowski! So I guess one of the big questions is what the heck is wrong with Phil Hughes? Or will he be getting a dedicated article as well? He’s lost velocity and unlike Tim Lincecum, he hasn’t adjusted to it. Lincecum is on a another stratosphere compared to hughes. Lincecum has 4 plus pitches, Hughes has his fastball and slightly cutting fastball which doesn’t bode well when he throws it at 89. Yes, but why did he lose velocity? Is it mechanical? Arm strength not being up to par? I’m starting to wonder if he’ll ever get it back. But overall there does seem to be plenty of major leaguers who have lost velocity this year. I still have the gut feel it’s merely because it’s April.